Rope wrapping serves a number of purposes beyond looking good. While its level of benefit is largely a matter of personal preference, many rowers feel that a rope-wrapped oar rows more effectively. Why wrap your oar shaft in rope? For only $25.00, Cataract Oars will wrap twenty inches of your oar shaft with rugged 3/16“ polypropylene rope. There are several reasons why many whitewater guides, recreational rowers and drift boaters love rope wrap on their oar shafts. For those who prefer the rope wrap, a rope-wrapped oar looks substantial, fitted out. In comparison, if rope-wrapping is your thing, an unwrapped oar can appear scrawny and denuded. Additionally, the rope wrap aesthetic harks back to the days when wood oars reigned supreme (wood oars were, for millenia, the only oars). Rowers would wrap rope around the portion of the oar that met the boat or oar lock to protect the wood from wearing at the contact point. Ropes were woven from hemp, jute, sisal, flax or some other natural fiber. Today, while outfitters and drift boat rowers love the performance of composite Cataract Oars; they often choose the rope wrap, at least in part, for its retro connotations. Such nostalgia is enjoying a moment in our culture today, and none of us are necessarily immune from its momentum. Like the lumberjack aesthetic or the renaissance of microbrews, the style of the rope wrapped oar is but another example of our infatuation with a less-complicated, predigital era in which men were manly, nature was close to hand, elemental forces were something one contended with on a daily basis—you get the idea. Practical reasons for wrapping your oar shafts. Note: Rope wraps are always made with black rope and are 20″ in length; unless otherwise specified. 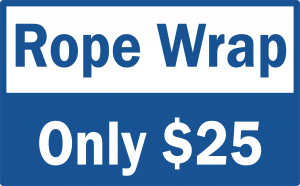 Custom rope wrap lengths and locations can be made and sometimes are required for proper setup due to variability of boat width and oar lock placement; call for pricing. Note: The rope wrap for the Mini-Magnum is always made with black rope and is 16″ in length. Fishermen and fisherwomen often prefer a rope-wrapped oar because it moves in the oar lock with less sound. The rope, a softer surface than the composite, creaks gently within the metal oar lock. Contrast with the grating, creaking and grinding of an unwrapped oar, and it’s easy to see why the rope wrap is a hit. The more snug fit in the oar shaft offers less opportunity for slippage, while the fibrous nature of the rope offers more traction to the oar lock. All of which translates into an oar that stays put a whole lot more. The oar stays responsive, allowing the rower to easily feather it in the water, without slopping about in the oar lock. Protecting the oar shaft from wear. Interacting with a metal oar lock can eventually take its toll on an oar’s surface. As the oar is pressed against the lock from this angle and that, twisted, feathered, turned and grated, micro-abrasions can compound over time, until the abuse manifests as a degraded surface and worn finish. The rope wrap, of course, fixes all of this; the tough polypropylene rope absorbs the pressures of rowing and insulates the composite from direct contact with the oar lock. Fishermen and fisherwomen often prefer a rope-wrapped oar because it moves in the oar lock with less sound. The rope, a softer surface than the composite, creaks gently within the metal oar lock. Contrast with the grating, creaking and grinding of an unwrapped oar, and it”s easy to see why the rope wrap is a hit. Interacting with a metal oar lock can eventually take its toll on an oar”s surface. As the oar is pressed against the lock from this angle and that, twisted, feathered, turned and grated, micro-abrasions can compound over time, until the abuse manifests as a degraded surface and worn finish. The rope wrap, of course, fixes all of this: the tough polypropylene rope absorbs the pressures of rowing and insulates the composite from direct contact with the oar lock. Looking for someone to rope wrap your oars for you? 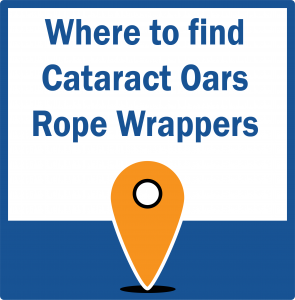 Check out the complete list of Cataract Oars-approved rope-wrapping outfits here. Hopefully, someone will be close enough to make it convenient and cost-effective to visit them!